Weber Spirit vs Genesis – Which Grill for the Summer ? Weber Spirit vs Genesis which grill is the one for your backyard BBQ this summer ? The smoke and sizzle of outdoor grill cooking is a part of summer and can best be enjoyed on an excellent grill. Whether you are making an old-fashioned family recipe or tinkering with your own special spice blend, an excellent grill is essential for making meat the star of the meals. The first Weber grill was created by George Stephen, who wanted to bring his family together for a good meal. Since that time, Weber has created many different types of grills, one of them being the famous Weber Spirit model. The other is the popular Genesis model. Both of them have become synonymous for enjoying a backyard barbecue with family, grilling up an entire menu, and simply enjoying the outdoors all summer long. 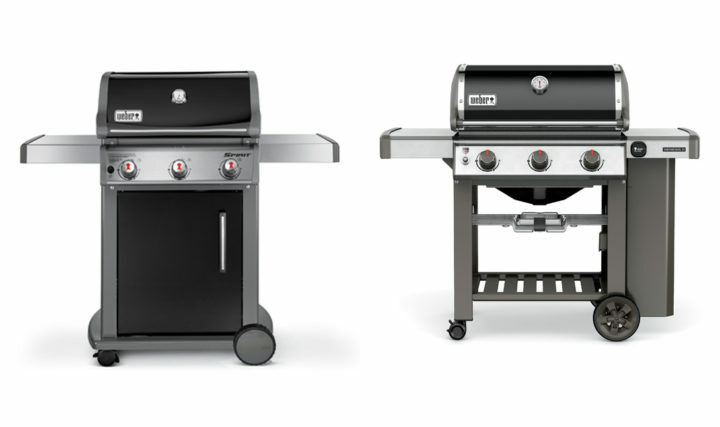 We decided to put these two Weber grills side by side, to see how they compare with their different features. There are plenty of different models for each product line and they each have their own unique design ideas. But, which one has the better design? What about the grilling cooktop, the steps it would take to clean a grill like this, or the care and maintenance over many backyard seasons? We’ve ‘grilled’ each of these two grills for all of their details, which are now presented in this article. Which will be the winner – the Weber Spirit or the Genesis? Read on to find out more! 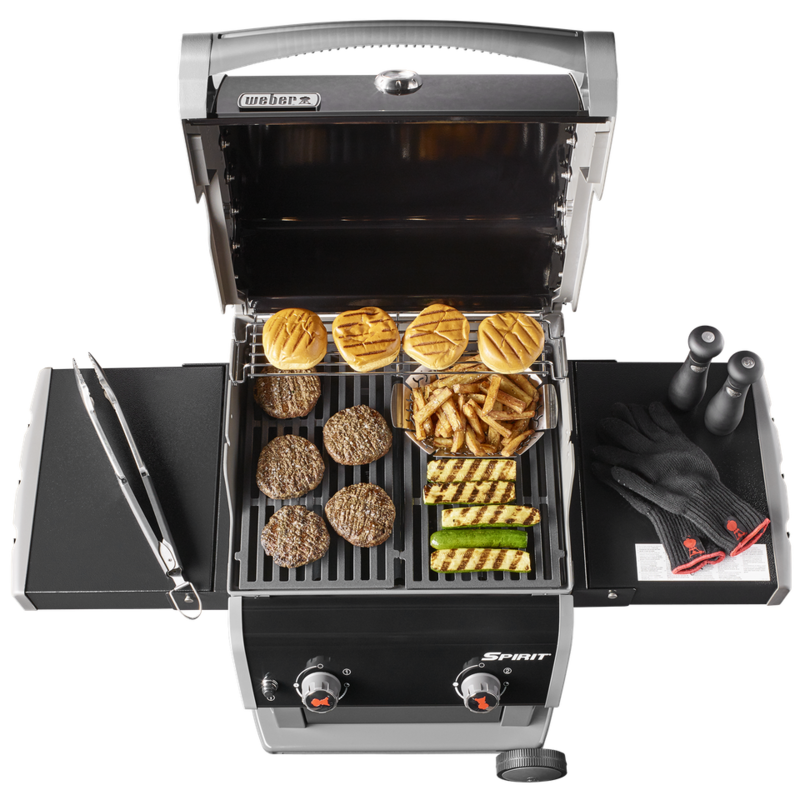 Weber does put together an attractive machine, and both of these grill models are no exception. The Spirit was redesigned back in 2013, and the Genesis has been upgraded with fancier technological features you’re sure to enjoy. When it comes to grills, you get your choice of two basic options: either an open cart with the bottom exposed to the elements, or a closed cart that keeps the liquid propane tank and tool storage hidden away. A grill’s design has to be able to withstand the outdoor elements, look attractive, and provide a place of convenience for all of the tools and accessories. While we appreciate the Genesis’s design, the Spirit wins in this category for its closed cart design. The Weber Spirit is an attractive upright grill design. The tank is held inside, and there’s a door that you open to access it. It offers more protection from the elements, keeping rain and inclement weather off your liquid propane tank. The Weber Spirit includes a handy 12,000 BTU side burner, as well as a 7,500 Sear Station Burner to boost heat quickly that can sear off foods. It turns off when it’s time to grill regularly. The entire cook box is made of cast aluminum. It helps the proper circulation of heat around the food, no matter if you’re using direct or indirect heat. The cooking grates are porcelain enamel coating, as well as the Flavorizer Bars. These are positioned above the burner tubes, but below the grates, shielding the burner tubes from any debris to clog them. They also turn food drippings into smoke to flavor your meats and veggies. There are three stainless steel burners that put out a combined total of 32,000 BTU per hour. You get 424 square inches of cooking area, plus an additional 105 square inches for warming. To start it up, you simply push the Electronic Crossover one-button ignition system. There are two generous side wings to set plates and tools. You also have the dials in front. This wonderful Weber Genesis grill has the aforementioned open cart design, so it’s not as attractive as the closed cart with doors. The tank is held on the outside. However, there are stainless steel side tables with integrated tool hooks on both sides, just like the Spirit. You can hang your burger flippers and tongs here. The cooking grates are thick and made of cast iron, coated with a porcelain enamel for durability in all kinds of weather conditions. They’re also reversible to provide either a thinner or wider sear. Above the cooking grate is the tuck-away warming rack. You can easily move it out of the way if you’re not using it, which is a great design feature. The Flavorizer Bars are also part of the design, catching drippings that turn into flavored smoke. Just like the Spirit, you’ll see on the front the one-push button Infinity Ignition for convenience. There are also three dials in the front for controlling temperature.As for size, you get 513 square inches of cooking space and an additional 156 square inches in the warming rack. The three stainless steel burners put out at least 26,000 BTU, depending on the model you get. Also, this has iGrill Bluetooth capability to connect with your phone and give you updated temperature controls. Winner: We’ve picked the Weber Spirit as the winner in this category, because it has a closed casing on the bottom. When it comes to grilling, there are several factors that come into play, including the convenience of accessing tools, the burner and BTU strength, and the ability to control the temperature. The burners in both models are high performance burners, which means they not only put out heat, they have a unique tapered shape. This delivers a consistent heat flow that goes from front to back. Even heat distribution is one of the secrets of excellent cooking machines. Rest assured that both the Weber Spirit and the Genesis will be able to grill evenly and consistently, when the foods are placed anywhere on the cooking grates. This is great for when you’re cooking for a crowd and need to use all of the burner space. Due to its three burners and 32,000 BTUs, the Weber Spirit can easily sear and grill even the thickest cuts. The cooking grate surface area is smaller than the Weber Genesis model, so you don’t have as much room to grill. While you have both stainless steel side tables, there’s no hooks included for tools. It takes a 20 pound liquid propane tank to use. One great thing about the Weber Genesis is that you can choose to grill with either liquid propane or natural gas. Both models are available in the three burner size. There isn’t as much heat being put out in the Genesis model as there is in the Weber Spirit. While it also has three stainless steel burners, it only puts out about 26,000 BTU, which isn’t a lot. It has much more cooking surface, though. You get 513 square inches in total space, which is plenty for grilling up multiple burgers, hot dogs, fish fillets, or steaks. But probably the best grilling feature of the Genesis is the iGrill. You can sync it with your smartphone via Bluetooth and keep on top of your food’s temperature controls throughout the cooking process. That is available on the Genesis II model. The iGrill feature is both a blessing and a curse, though; it makes the Genesis much costlier. Winner: While both of these grills would cook up an excellent medium-rare steak, the Weber Spirit wins this category, simply because the BTU heat amount is higher. Purchasing one of these wonderful Weber grills is like adding an extra oven to your backyard, so it does add to the cleaning and maintenance of both models. While neither one of them is extremely easy to keep clean, they do have design features that help assist with that. Also, the Genesis has an added bonus of a grease management system, too. That makes it the greater grill in this contest. The cook box is really the section of the grill that needs the most cleaning and maintenance. It’s made of cast aluminum and can withstand the heat needed to grill at any temperature. There is also a more minor grease management system built into this Weber Spirit grill, too. The Flavorizer Bars help move drippings away from the entire cooking system. The Genesis has an entire built-in grease management system that is more complicated and better than the Spirit. It helps with removing grease, while at the same time minimizing the risk of flare-ups. That makes it not just a wonderful cleaning system, but also a safety feature, too. How it works is that any drippings that aren’t vaporized by the Flavorizer Bars are automatically funneled away from the burners. Those drippings are then deposited into the disposable drip tray, which you can find within the catch pan under the cook box. All you have to do to empty it is to remove the catch pan and replace the drip tray as you need to. Winner: The Genesis wins this category. When it comes to grills, you don’t want to sacrifice quality for budget, but it’s not easy to purchase a very expensive machine like this. Both grills are pricy, with the Genesis being more expensive because it has a larger cooking surface and has more features, like the iGrill technology addition. The Weber Spirit has a lower price and, while lacking in the fancier technology feature of the iGrill like the Genesis has, you also get the nice design of the closed-cart style. The least expensive version is the Weber Spirit E210, while the Weber Spirit E310 and the Weber Spirit E330 are going to set you back more in costs. The E210 only has two stainless steel burners, less heat, and a much smaller cooking surface. The E310 has the three burners, while the E330 has three burners as well, but it’s definitely the largest of the three. You can choose to purchase these models unassembled, which is less expensive as well, and put them together yourself. It takes about two-and-a-half hours. 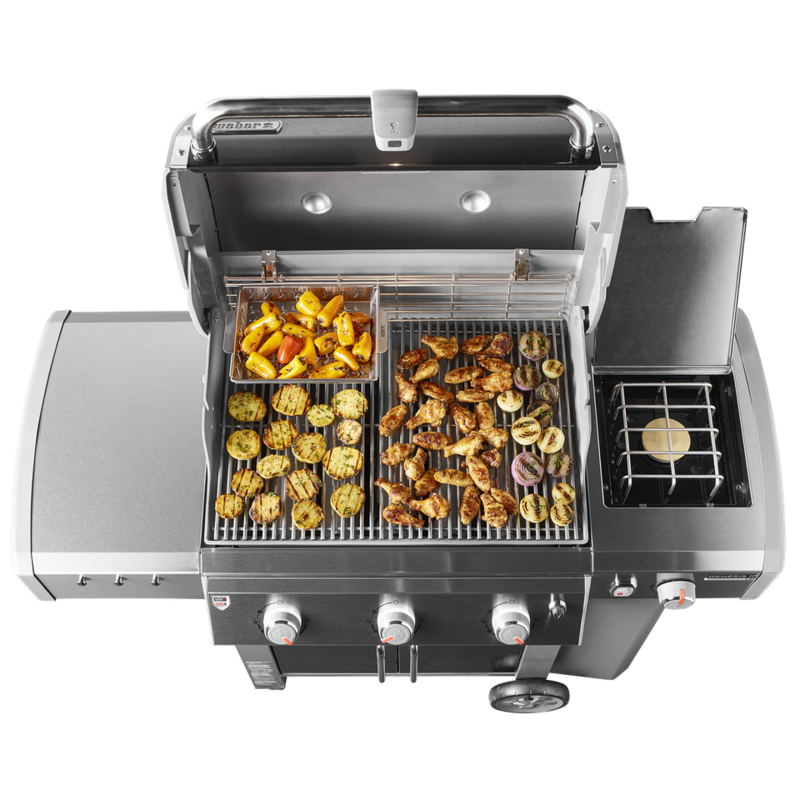 The Genesis models from Weber are considerably more expensive than the Spirit models, and that’s because of the iGrill feature. The price difference is quite dramatic, especially when comparing models of a similar size. So, we had to dock points for that. One cool tech feature shouldn’t make the price go to $700 and up. The Genesis grill is also a cart style, so that could contribute to higher costs and make it more expensive to manufacture. While the Genesis is offered in either liquid propane or natural gas, oddly, there’s the same price for both. There are four Genesis models that increase in price as you add more features and a wider cooktop. The E-210 is the smallest, and then there’s the E-310, the E-410, and the E-610. With the E-610, you get the most features and it puts out up to 60,000 BTUs of heat, plus 770 square inches of cooking space. Winner: The Weber Spirit takes the win. Weber Spirit vs Genesis: Who’s the Winner? So, now that you’ve gotten a chance to compare the best features from both the Weber Spirit and the Weber Genesis grills, which one is the winner? The Weber Spirit grill wins over the its counterpart, the Genesis, with a combined score of three out of four. The Weber Genesis is an excellent grill; it’s just that when compared side by side to the Weber Spirit, it doesn’t match up. It’s easy to see why the Weber Spirit is the better choice for outdoor grilling: you can choose different models depending on the size cooktop you need. It has an enclosed cart style to protect the liquid propane tank from the weather, it doesn’t have the iGrill technology that unnecessarily raises the cost, and it’s got great heat and all the wonderful features that Weber grills are known for. That’s the Spirit!